Checking out books! What a concept! Some marketing geniuses have dreamed up an online rental program similar to Nexflix -- only instead of DVDs, customers can rent their favorite books. How can such a business actually make money? I think I'll stick with the current book-borrowing system offered by my local public library. 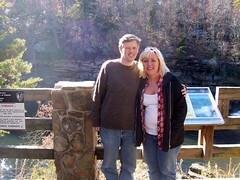 Misty and I celebrated our 5-year anniversary with a trip to Little River Canyon. Well, it wasn't really a celebration -- Misty had a Fresh Air Family event to host there. The actual anniversary trip comes next week at Disney World. Nevertheless, we had a pleasant (though brief) picnic at the waterfall before the afternoon's storytelling event. Afterward, we stopped at a few places in Fort Payne to take silly pictures. We made voting last night a family event. Expecting the line to be long (since there were more than 500 people lined up when I passed by on my way to work), we picked up a pizza to eat while we waited. When we got to the polling place though, there was no line at all. We enjoyed our pizza in the car before going in. Misty went first while I waited with the girls, but when it was my turn Emily wanted to go in with me. We found a table where we could sit down together and fill out my ballot, and I showed her how it worked, coloring in the boxes next to the names of the candidates you wanted to vote for. After a few minutes Emily asked me, "Where's Barack Obama?" I pointed to his name on the ballot and said, "He's right here. We've already finished that section." "No, not his name," she told me, "the man." "He's in Illinois," I said. "That's another state." "Then what are we doing here?!" she wanted to know. It turns out that Emily thought we were going meet Obama and she would get to play with his kids. After voting, we drove by Ben & Jerry's, but the line was wrapped out the door and down the sidewalk. Though we'd have waited it out to vote if we'd needed to, the idea of standing in that line for a free scoop of ice cream didn't seem worth it, so we continued on to Krispy Kreme instead. There was a big line for free donuts too, but it was somewhat more manageable. Krispy Kreme has more space inside, and it's easier to hand off a donut to each customer than it is to scoop out an ice cream cone -- it moved along pretty quickly. Emily watched the donuts getting made and made quick friends with a couple kids wearing McCain / Palin buttons that matched those of their parents. Our Krispy Kreme location didn't have the special star-shapped donuts, but at least they had red, white and blue sprinkles. We each got one (even though the girls obviously didn't vote -- I thought that was nice). When we got home, we watched the results trickle in on CNN, then switched over to The Daily Show's live coverage. When Jon Stewart announced Obama's victory, I thought it was a joke -- a sort of "well, he's so far ahead, we'll just go ahead and call it." But switcing back to the "real" news, we learned that it was true. I'm proud that my daughters got to be a part of the election night process, if only as observers. I doubt they'll remember the day when they're grown, but they'll always be able to say that they were there. The girls went trick-or-treating last night dressed as characters from The Wizard of Oz. Emily was Glinda the Good Witch and Kendall was Dorothy. I even convinced Emily to ask people as they answered their doors, "Are you a good witch or a bad witch?" Having also attended Fresh Air Family's Halloween-themed annual fundraiser, Trunk-or-Treat at our new church, and a Halloween party from Misty's mom's club, this was the fourth time the girls have gotten to dress up within the month. I'm glad they got so much mileage out of their costumes (though Emily wore something different each time). A lot of the houses in our neighborhood were dark on Halloween night, and it surprised me to see several cars parked along the street where parents had driven kids in from other neighborhoods. Ours doesn't seem the most trick-or-treat-friendly subdivision. Nevertheless, the girls returned home with a massive haul of candy (much of which was confiscated overnight by the "Candy Witch"). More fun than candy or dressing up though, was before bed when Emily and Kendall went wild "styling" Mimi's hair.